Want to get noticed in social networks, try Image to ASCII converter to give your photos a new look. It is a very small tool and very easy to use. It is free to use . To use it, load images in it and it will convert it to ASCII or text automatically , you can choose to adjust brightness, contrast , levels , dither in the converted image. The result can be saved as text (.txt, .ans), HTML (.html) or as an image (.jpg). You can influence the conversion by altering certain options (font, font size, scale factor, color etc.). 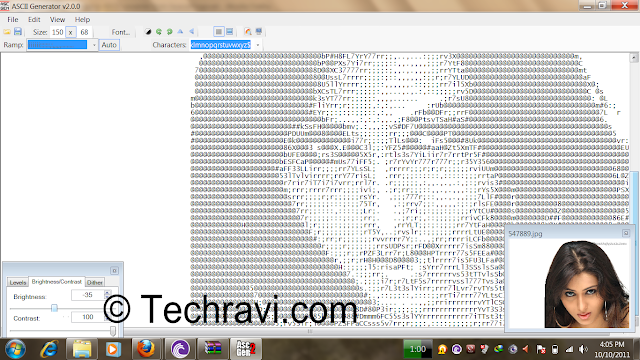 It is a very nice tool which i used personally for converting images to text. There are many online tools are also available for the same purpose , i will post about them later. Download it here. Share it with your friends and leave your comments here.